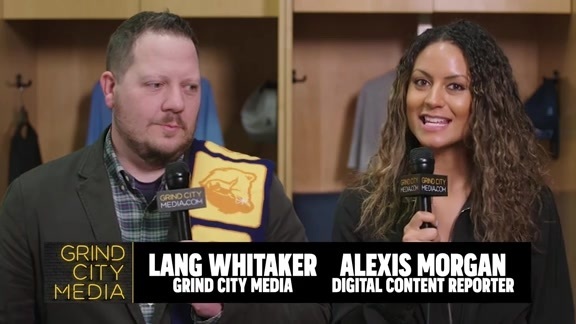 Grind City Media’s Alexis Morgan and Lang Whitaker break down the Grizzlies victory over the Pelicans. Take a closer look at key moments in the Grizzlies’ win against the Pelicans in Memphis. 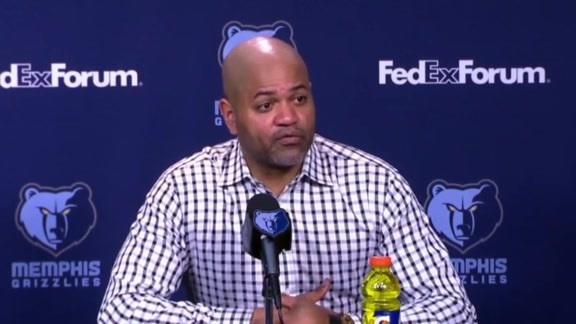 Grizzlies Head Coach J.B. Bickerstaff addresses the media after the win against the Pelicans. 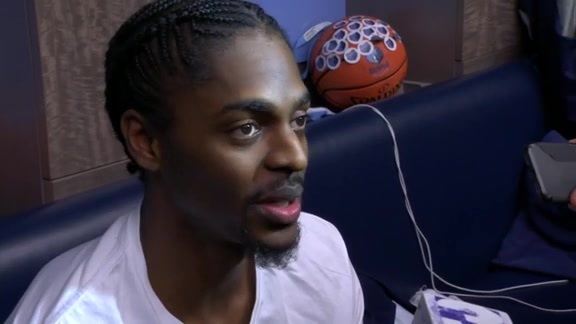 Hear from Justin Holiday as he speaks with the media after Saturday’s victory over the Pelicans. 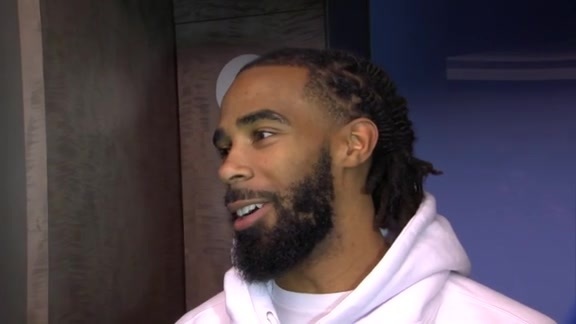 Grizzlies guard Mike Conley addressed the media following Saturday’s victory over the Pelicans. Watch highlights of the Grizzlies matchup against the Pelicans in Memphis on Saturday. Jackson Jr. draws a foul on a three-point shot attempt and completes the four-point play at the line. 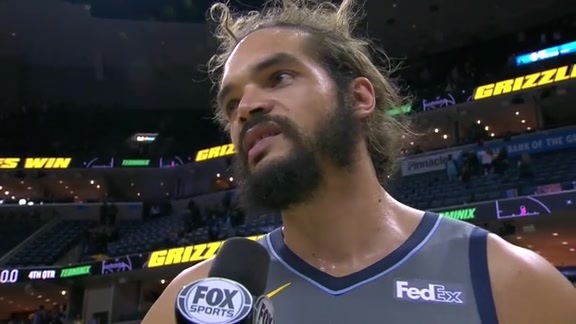 Find out what Joakim Noah had to say after the Grizzlies win against the Pelicans. Joakim Noah scored 19 points and added 3 assists on Saturday night against the Pelicans. 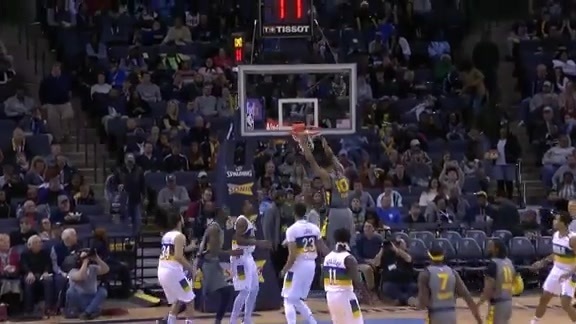 Conley finds Ivan Rabb cutting to the rim and Rabb finishes with a two-handed slam. Avery Bradley plays tight defense, strips Jrue Holiday of the Pelicans and goes coast to coast to finish a fast break layup. 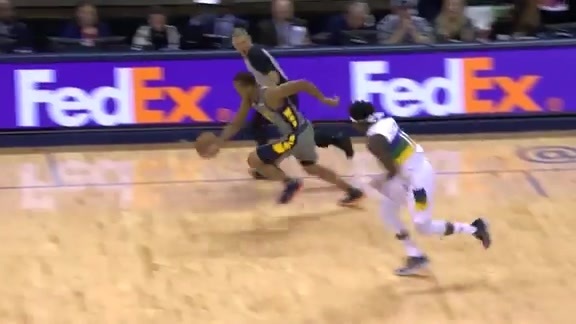 Justin Holiday tips in the loose ball down low amongst the Pelicans defenders. Noah drives to the rim and completes the reserve layup for a chance to convert a 3-point play. 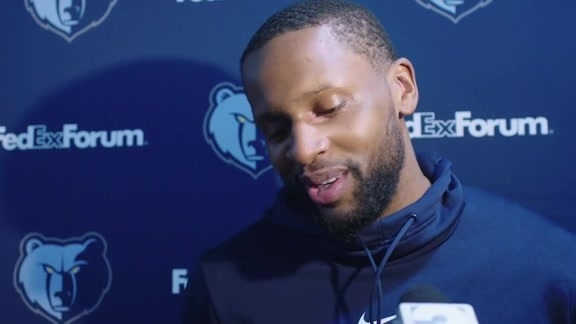 Guard-forward CJ Miles talks to the media heading into tonight’s game against the Pelicans at FedExForum. 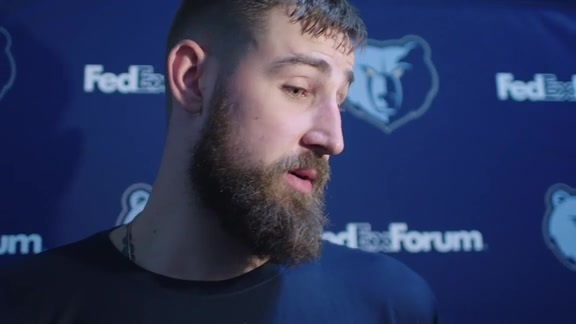 Center Jonas Valanciunas addresses reporters before Saturday’s game against the Pelicans at FedExForum. 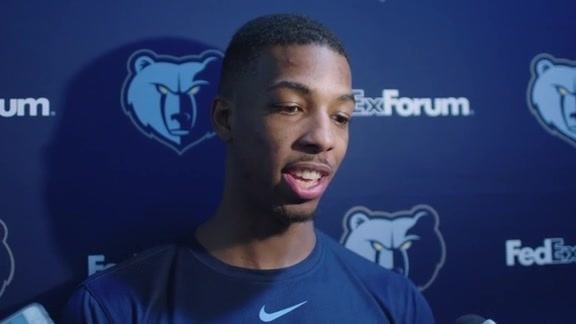 Grizzlies guard Delon Wright addresses the media ahead of tonight’s matchup against the Pelicans in Memphis. 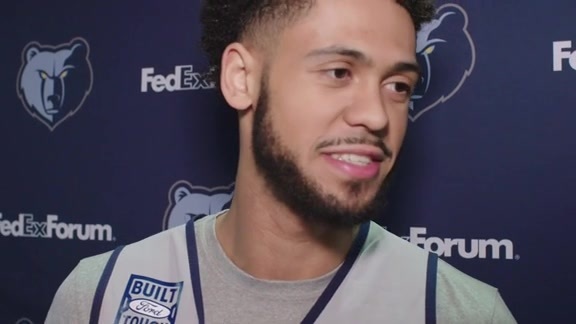 Grizzlies Guard Tyler Dorsey spoke with the media following Saturday’s shootaround at FedExForum as the team prepares for the Pelicans. 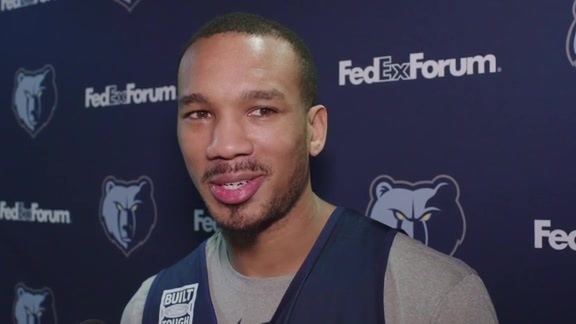 Grizzlies guard Avery Bradley addresses the media ahead of tonight’s matchup against the Pelicans in Memphis. 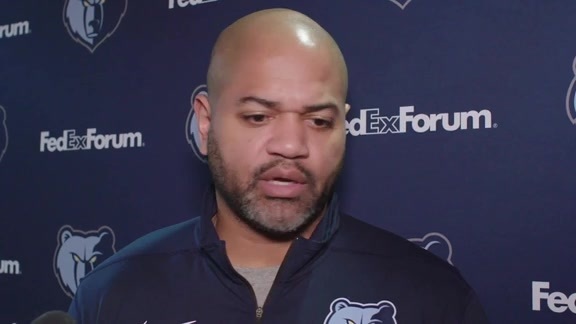 Grizzlies head coach J.B. Bickerstaff addresses the media ahead of tonight’s matchup against the Pelicans in Memphis. The Pelicans made just 6-of-33 (.182) three-pointers on the night, their second-worst performance from beyond the arc, and the lowest by a Memphis opponent this season. 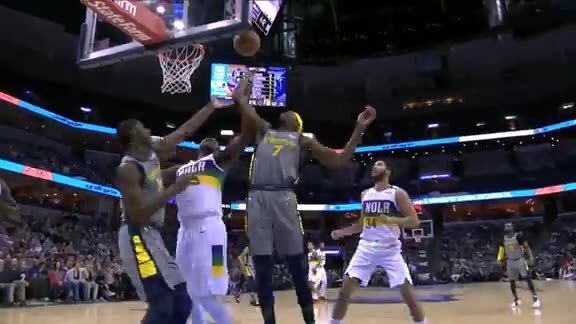 With 2:41 remaining in the game, Jaren Jackson Jr. hit his second three-pointer of the fourth quarter to start an 8-2 run that lasted until the 1:10 mark. 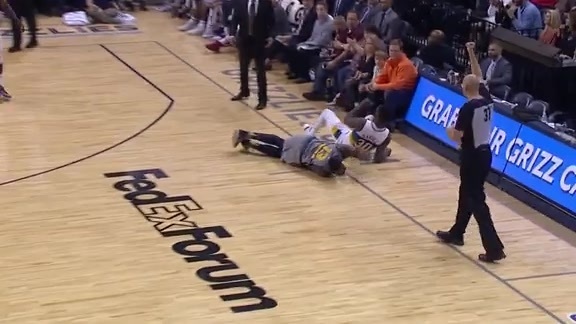 The run would put the Grizzlies up 99-87 and seal the game. The Memphis Grizzlies held the New Orleans Pelicans to the lowest three-point percentage they’ve allowed all season, picking up a 99-90 win Saturday night at FedExForum. 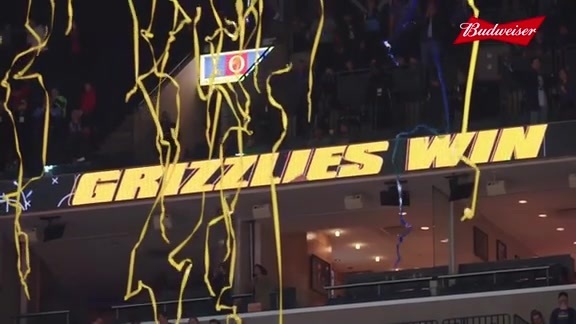 The Grizzlies improved to 23-34 on the season and 14-14 at home. The Pelicans dropped to 25-32 on the year and are now 9-22 on the road. The teams split the season series 2-2. The Pelicans made just 6-of-33 (.182) three-pointers on the night, their second-worst performance from beyond the arc this season. The Grizzlies weren’t much better however, finishing 8-of-29 (.276) from long range. Joakim Noah earned his second double-double of the year, leading the Grizzlies with 19 points and 14 rebounds (both season-highs). It’s the second time in his career that Noah has posted 15+ points and 10+ rebounds while coming off the bench, with the other time coming on Dec. 31, 2008 (19 points, 11 rebounds). Justin Holiday added 15 points (3-5 3P). Holiday has now scored in double-digits in seven out of 13 games since cracking the starting lineup. Jaren Jackson Jr. finished with 14 points and a pair of steals, scoring in double figures for the fourth-straight game. In his first contest in a Grizzlies uniform, C.J. Miles finished with 13 points on 6-9 (.667) shooting off the bench. Mike Conley just missed a double-double, scoring 10 points and handing out a game-high nine assists. Ivan Rabb also narrowly missed a double-double, chipping in with 10 points and nine boards. Newcomers Avery Bradley and Delon Wright also made their first appearances since joining Memphis, with Bradley scoring eight points and Wright adding seven. The Grizzlies finished the game going 38-for-88 (.432) from the field, while holding the Pelicans to 34-for-86 (.395) shooting. Memphis is now 10-4 this season when holding an opponent to under 40 percent shooting, and it marks only the second time this year that New Orleans has been held under 40 percent. The Pelicans grabbed 17 offensive rebounds (the second-most by a Grizzlies opponent this year) while the Grizzlies had 10, leading to a 15-9 advantage in second chance points for the Pelicans. Julius Randle led the Pelicans with 21 points to go with six boards. Randle has now scored 20+ points in 29 games this season. In his four games against the Grizzlies this season, Randle has averaged 20.5 points and 10.0 rebounds. Anthony Davis recorded his 33rd double-double of the season, scoring 14 points and pulling down a game-high 16 rebounds. Rookie Kenrich Williams logged his first career double-double, scoring 10 points and grabbing 13 rebounds while also passing out a team-high seven assists. Jrue Holiday chipped in with 15 points and five assists. Down by as much as 10 in the final quarter, New Orleans battled back, with a Randle basket trimming the Memphis lead to 87-83 with 4:41 left in the game. Jackson Jr. responded in a big way, converting a four-point play on the ensuing possession to push the lead to 91-83. 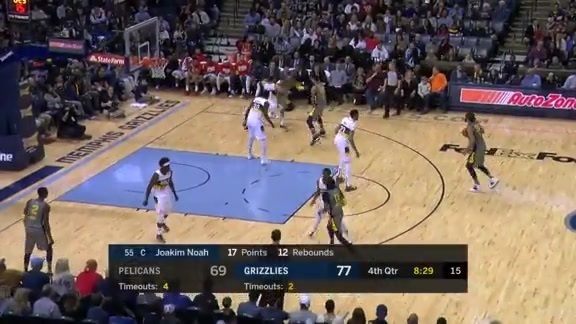 With 2:41 remaining, Jackson hit another big three to start an 8-2 run that lasted until the 1:10 mark, putting the Grizzlies up 99-87 to seal the game. Memphis was clicking coming out of halftime, opening the third quarter with a 10-2 run. The Grizzlies went 13-for-23 (.565) in the quarter, and made 3-of-6 (.500) treys. New Orleans’ three-point shooting woes continued, going 1-for-8 (.125) in the third. 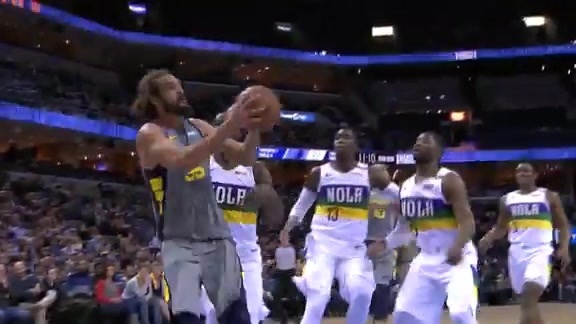 The Grizzlies forced the Pelicans into seven turnovers during the period while committing three of their own, and outscored the Pelicans 11-2 off of turnovers to help build a 72-62 lead heading into the final quarter. Neither offense could find a rhythm in the first half, as both teams shot under 39 percent and combined to go 4-for-29 (.138) from three-point range. Each team committed six turnovers in the half, but the Pelicans scored 12 points off the giveaways while the Grizzlies had just four. Both teams also earned 12 free throw attempts, but Memphis was far better, knocking down 10 of them compared to five for the Pelicans. Memphis struggled to get going at the start of the game, missing five of their first six shots as the Pelicans took a 10-2 lead. The Grizzlies shot just 7-for-20 (.350) in the first quarter while the Pelicans went 11-for-18 (.611). Noah gave the Grizzlies a spark in the quarter, scoring six points and grabbing six rebounds (three offensive boards). The Grizzlies defense tightened up towards the end of the first, holding the Pelicans to just four points in the final 3:13 to trim the Pelicans lead to 28-20. The Grizzlies carried over their strong finish from the first quarter, opening the second with an 9-0 run from 11:35 to 9:10 (2:25 run) to take their first lead of the game at 29-28. The Memphis defense held New Orleans to 7-for-29 (.241) shooting and 2-for-11 (.183) from three in the quarter, but they did allow the Pelicans to grab nine offensive rebounds. The Grizzlies continued to have a tough time shooting, going 8-for-22 (0-7 3P) in the period. Randle laid in a shot as time expired to increase the Pelicans’ lead to 44-41 heading into halftime. The Grizzlies will wrap up another Southwest Division series when they host the San Antonio Spurs on Saturday, February in FedExForum at 7 p.m. CT. Come out to the game, tune in to FOX Sports Southeast presented by Pinnacle Financial Partners or listen on 92.9 FM ESPN to follow the action. I think it’s more about the possibilities. I don’t think tonight, offensively especially, was a true sign of who we can be. We had a shootaround with some guys. We had a small walkthrough with some of the other guys. 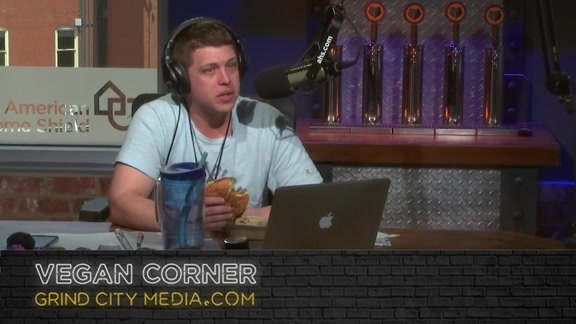 So obviously there’s some continuity and things like that that we can build on, but if you look at the competitive nature and how they got after it on the defensive end through mistakes, they still kept fighting, still kept playing together. And after the way we started the game… It was an ugly beginning, but the guys never got rattled. They never got separated. They figured out a way to pull it all together and go out and win the game. Ton of credit to Joakim [Noah]. He had a flashback to a few years ago. He was all over the place, and I think he led the charge with his energy. We have to give a ton of credit to Jaren and a ton of credit to our assistant coaches who work with him every single day. They’ve helped him not only with the physical aspects of the game but the mental aspects of the game as well. Early on, those two fouls would’ve led to a ton of frustration. The third one would’ve probably come right behind it but through film, through watching and learning technique, he’s taken steps in that area. The kid is fearless. Go all the way to back to his first summer league game. There’s no moment that’s too big for him. Obviously he had, as a rookie, his up and downs and things like that, but it’s never because he’s been overwhelmed. He’s got that courage, and now it’s just the understanding of, how do you take over the fourth quarter? How things change in the fourth quarter. Whistles are a little tighter in the fourth quarter especially when you’re banging down there in the post. Now you have to be able to create your space and create your shots down there. So I think that’s where he’s going to take a step. The skill’s there. The want to is there, so now it’s just going to be a matter of experience for him. Going through some trial and error. I feel like we really have like 10 new guys, even our young guys Jaren [Jackson Jr.] and Ivan [Rabb], they’re still fairly new to the game and adjusting to the speed of the NBA game. We’re really out there just trying to find each other, find a rhythm. We put in like four plays a day. We ran all four – that’s about it. You can just see guys are just playing hard. Thankfully we were able to get a win. It’s very encouraging. You don’t really know what to expect. I know it’s hard for guys coming in on the first game off of a trade. Still waiting on [Jonas] Valanciunas to be active. We didn’t know what to expect. For guys to come out and be able to withstand an early run from New Orleans, get back into it and kind of find our rhythm and see what we’re capable of doing, playing a little bit faster is very encouraging. I think we started to actually just settle down and just play. I think in the beginning, with everybody being new, we’re in some things differently. We kind of got out of what we regularly did and weren’t getting stops. I think we got a little more comfortable in the second half, too. We got back to playing the Grizzly-grit basketball. That energy. He’s bound to play like that night in and night out when he plays the way he does. He comes in and does his job every night. There are going to be times when he’s going to play like this and the more he does play like this for us, the better we’re going to be. I’ve played with Jo on three different teams so I love that man. He’s a very, very big help to this team. Joakim Noah earned his second double-double of the year, leading the Grizzlies with 19 points and 14 rebounds (both season-highs). It’s the second time in his career that Noah has posted 15+ points and 10+ rebounds while coming off the bench, with the other time coming on Dec. 31, 2008 (19 points, 11 rebounds). Justin Holiday added 15 points (3-5 3P). Holiday has now scored in double-digits in seven out of 13 games since cracking the starting lineup. Jaren Jackson Jr. finished with 14 points and a pair of steals, scoring in double figures for the fourth-straight game. In his first contest in a Grizzlies uniform, C.J. Miles finished with 13 points on 6-9 (.667) shooting off the bench. Newcomers Avery Bradley and Delon Wright also made their first appearances since joining Memphis, with Bradley scoring eight points and Wright adding seven.